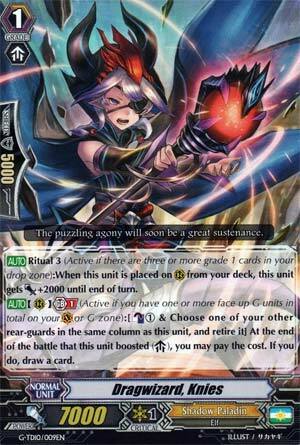 [AUTO] Ritual 3 (Active if there are three or more grade 1 cards in your drop zone):When this unit is placed on (RC) from your deck, this unit gets [Power]+2000 until end of turn. [AUTO](RC) Generation Break 1 (Active if you have one or more face up G units in total on your (VC) or G zone):[Counter Blast (1) & Choose one of your other rear-guards in the same column as this unit, and retire it] At the end of the battle that this unit boosted, you may pay the cost. If you do, draw a card. The Grade 1 Dragwizard. When placed on RG circle from the deck when Ritual's active, he gains 2k until end of turn. His GB1 activates when he's finished boosting: you CB1 and retire one other unit you have in the same column to draw a card. appealing beyond a field cleanup. Wasn't expecting much, so there you have it.